SALISBURY, Md. (November 21, 2016) – Nothing defines Thanksgiving as much as the turkey and all the trimmings. So it’s natural to think of the farmers who raised the feast and be thankful for the fruits of their labor. According to Feeding America, 12.7 percent of the Maryland population is food insecure. Let’s thank those farmers who are raising food to feed friends and family, and make it available at roadside stands. Maryland farmers have an $8.25 billion impact on the state’s economy, making agriculture the Free State’s Number One industry! Maryland’s farms support 45,600 jobs in the agriculture and food sector. Maybe even yours? Like their counterparts nationwide, Maryland’s 12,000+ farms are 98% family owned, often through generations. If you care about our environment and the Chesapeake Bay, there’s good news: Farms have a lower environmental impact than developed land. 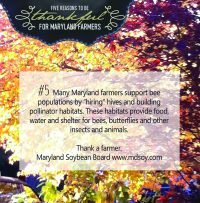 Actually, many of Maryland’s farmers have installed “best management practices” on their farms to enhance the environment. The Maryland Soybean Board administers soybean checkoff funds for soybean research, marketing and education programs in the state. It is funded by farmers through an assessment of one-half of one percent of the net market value of soybeans at their first point of sale. One-half of the checkoff funds stay in Maryland for programs; the other half is sent to the United Soybean Board. In Maryland, farmers grow about a half a million acres of soybeans, producing more than 20 million bushels of beans each year. With a value of $173 million to the state’s economy, soybeans are one of Maryland’s top crops. For more information on the Maryland Soybean Board, visit www.mdsoy.com.